The other day, Kevin Honeycutt tweeted about Rhythm Cat Lite (I believe he was visiting with music teachers at Inman, Kansas). I downloaded the app, and realized that it could be beneficial for my students. 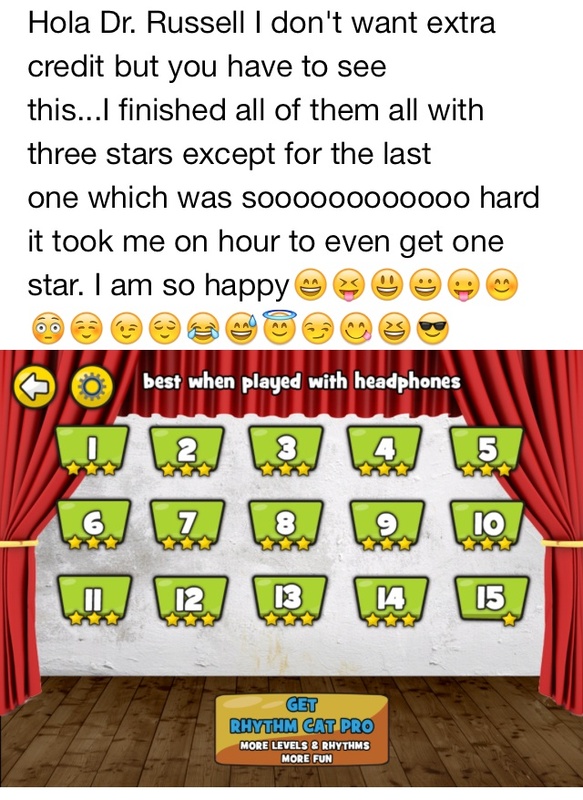 The app requires users to tap rhythms correctly using an Angry Birds level interface. We use SmartMusic for daily sight reading (just one exercise a day with the “Singing at First Sight” book series), and they really do cooperate with SmartMusic in class. Still…they need help. So why not gameify the process? As I went through the Lite (free) version, I realized that the 5th exercise is where we are at with rhythm in the books. So I created an extra-credit assignment: complete all the way to the 5th level, take a screen shot of the completed score on the 5th level, import the picture into any app of your choice and sign your name to it, and then submit it to me via a Homework Submission Form (a new strategy I will write about later). That was one of the nicest e-mails I have received in a long time (I particularly like the variety of smiley faces used by the student). This works as an extra-credit assignment for me as each student has their own iPad, and the app is free. If you do not have iPads, Thank you to the Inman music teachers who suggested the app, and to Kevin Honeycutt for suggesting it.